As team communication and collaboration grows, the number of notifications/news feeds coming your way can get overwhelming. For each team (project/group/department/opportunity) and modules. You can now manage notifications your receive without having to work at separating what’s important to them from rest of the updates. There may be instances where you would like to be part of a team but wish to be notified of only selected feeds inside a team or for no feeds at all. 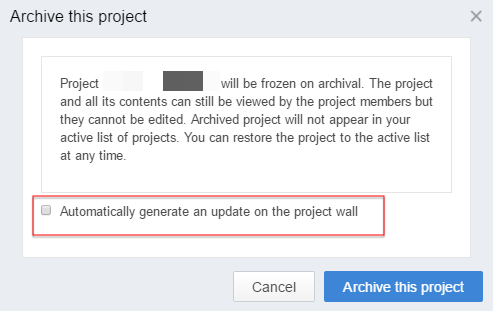 In such scenario; the network admin, team admin or team creator (Group, Project or Department) can set the notification setting during the creation stage of a Team. The setting can also be edited later from team details or selecting Team Tools. Team admins can set the default notification preference for their teams. Team level selections ensure that the default management of notifications is de-centralized from domain admins. Below are the settings that the admin or creator can choose. The notification preference will be applied as the default for all new members in the team. 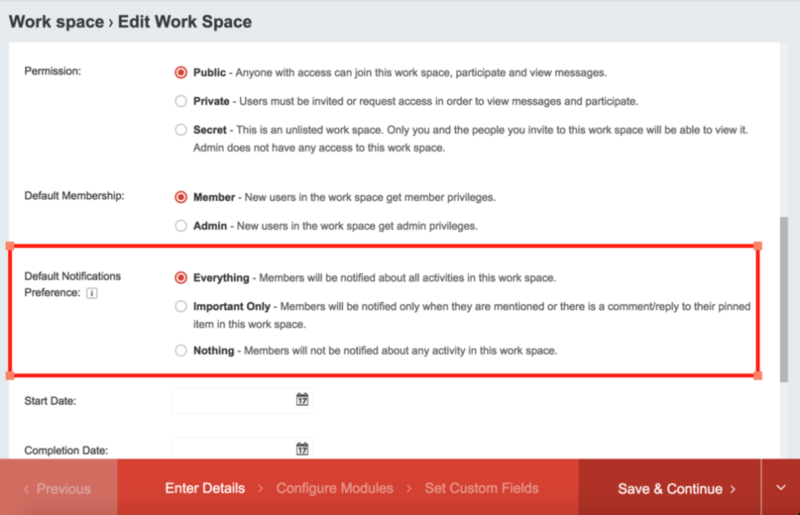 A member can additionally override this setting as per their preferences. a. Everything – Team members will be notified in real-time about all activities in this project. c. Nothing – Team members will not be notified in real-time about any activity in this project. If this setting is checked, then the feed will be marked as ‘Read,’ even if the user is mentioned for the feed. Team members with this setting will not get any real time notifications. However, they will continue to get the email notification (if enabled). Notification Preferences selected in a team will only affect the notifications for that particular team and no other. Team members can override the default set by the team admin as per their preference. Team members have the same three choices per team available to them as the team admin. A team members personal preference will not be overridden if the team admin changes the default preference later. Once the notification preference is set, it will be effective for the user on all platforms (Mobile App, Desktop Client, Web Browser). To change the notification preference the users are required to use the web browser interface. MangoApps also allows you to control Mobile & Desktop installation Notification. 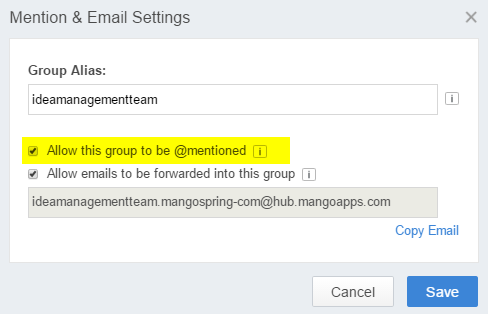 Domain admins have the option to turn off the default auto-generated message when someone installs the MangoApps Mobile App or Desktop client (Windows/Mac). If the setting is checked, then it will generate a notification when someone installs MangoApps mobile or desktop client. i. Team admin has an option not to generate a notification when a team is archived. ii. Team admin has an option not to generate a notification when he assigns or removes additional team admins. iii. 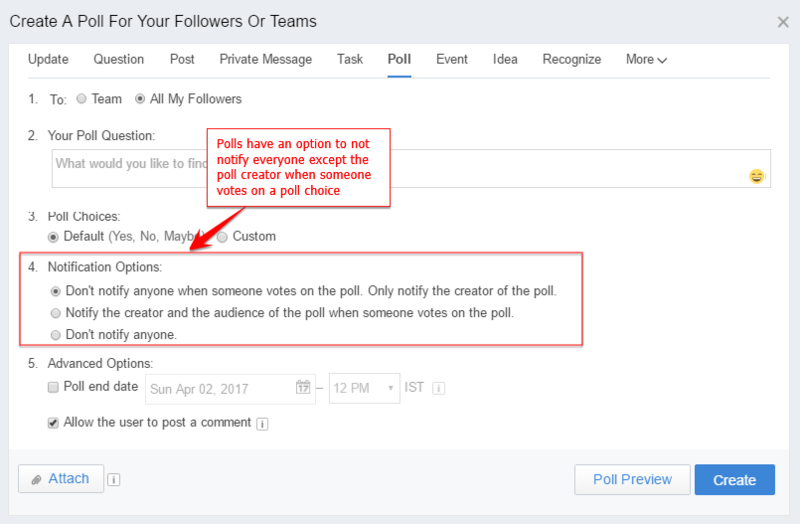 Editor of a post can choose not to notify team members/followers for minor updates. v. Polls have an option to not notify everyone except the poll creator when someone votes on a poll choice. a. Click on the ‘Three dots’ inside the team.